Sulzer RTA72U diesel engine -How it works ? The RTA72U is a single-acting, low-speed, two-stroke reversible marine diesel engine manufactured by New Sulzer Diesel Ltd. It is one of the RTA series engines which were introduced in 1981 and in addition to a longer stroke than the earlier RL series, it has a cylinder-head exhaust valve providing uniflow scavenging. The bedplate is single-walled and arranged with an integral thrust bearing housing at the aft end . Cross members are steel fabrications although the centre section, incorporating the main bearing saddle tie-bolt housings, may be a steel forging. To resist crankshaft loading and transverse bending, the main bearing keeps are held down by jackbolts. The crankcase chamber is arranged by using individual A-frames for columns which are also the mountings for the double-slippered crosshead guides. The A-frames are joined together by heavy steel plates and short angle girders to form a sturdy box frame. The A-frames in way of the thrust block are manufactured as a one-piece double column to ensure accurate mesh of the camshaft drive gears which are enclosed in this section. Individual cast-iron cylinder blocks are bolted together to form a rigid unit which is mounted onto the A-frames. Tie bolts extend from the top of the cylinder block to the underside of the main bearing saddles. The crankshaft is semi-built, with the combined crankpin and crankweb elements forged from a single element. The journal pins are then shrunk into the crankwebs. For all but the larger numbers of engine cylinders, the crankshaft is a single unit. The main journal and bottom-end bearings are thin-walled shells lined with white metal. The forged connecting rod has a 'table top' upper end for the mounting of the crosshead bearing. A large crosshead, with floating slippers at each end, is used. The piston rod is bolted directly to the top of the crosshead pin. The pistons are oil-cooled and somewhat shorter in length than earlier designs. There is no piston skirt. Five piston rings are fitted which are designed to rotate within their grooves. Cylinder liners have a simple, rotationally symmetrical design with the scavenge ports at the lower end. The deep collar at the upper end is bore-cooled, as are all components surrounding the combustion chamber. Cooling water is fed from below through a water guide arranged around the liner. Cylinder lubrication is provided by eight quills arranged around the lower edge of the collar on the liner. The more recently introduced RTA series engines all have oil-cooled pistons with oil supplied from the crosshead bearing up through the piston rod. A piston rod gland separates the crankcase chamber from the under piston space. Various scraper and sealing rings are Fitted within the gland. The cylinder head is a single steel forging arranged for bore cooling with appropriately drilled holes. Pockets are cut for the air starting valve and fuel injection valves, the number depending upon the cylinder bore. The centrally mounted exhaust valve is fitted in a cage with a bore-cooled valve seat. The valve stem is fitted with a vane-type impeller to ensure valve rotation. 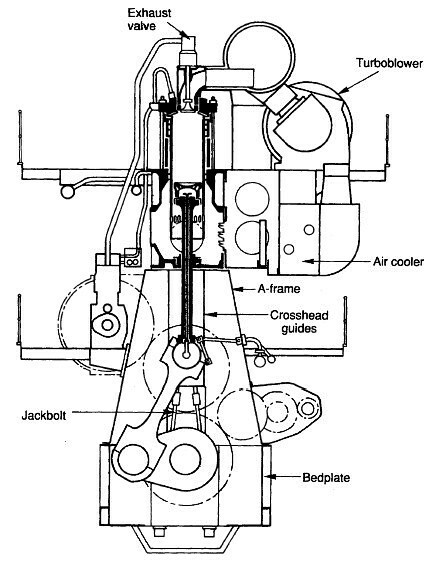 The valve is opened by hydraulic pressure from pumps driven by the camshaft and closed by compressed air. The camshaft is located at engine mid-height and is gear driven from the crankshaft. The initial gear drive is bolted to the rim of the thrust block and a single intermediate wheel is used. On larger-bore, high-powered engines the gear drive is in the centre of the engine. The camshaft extends the length of the engine and each individual segment carries the exhaust valve actuating and fuel-injection pumps plus the reversing servo motor for one pair of cylinders. Constant-pressure turbocharging is used, and electrically driven blowers cut in automatically when the engine load is at about 40% of the maximum continuous rating. Lubricating oil is supplied to a low- and a medium-pressure system. The low-pressure system supplies the main and other bearings. The crosshead bearing, reversing servo motors and exhaust valve actuators are supplied by the medium-pressure system. Cylinder oil is supplied to lubricators from a high-level service tank. Double valve controlled, variable injection timing is used to deliver fuel to multiple, uncooled injectors and an electronic governor is supplied as standard. Where the engine has oil-cooled pistols they will be supplied from the lubricating oil system, possibly at a higher pressure produced by booster pumps, e.g. the Sulzer RTA engine. An appropriate type of lubricating oil must be used for oil-lubricated pistons in order to avoid carbon deposits on the hotter parts of the system.